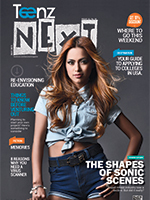 Teenz Next is the voice of the young urban Nepali. The content is a hip and happening blend of topics as diverse as fashion, technology, trends, sports, events, and even social issues like eco-friendly practices. Worked on by young people, writing on issues that are important to them, it is the most widely read youth magazine in Nepal. Highlight current trends among our young audience. Update teenagers on latest fashion, technological, and educational trends. Encourage reader interactivity through reader- submitted creative writing pieces. Provide a platform to teenagers where they can have ownership of a publication designed for them.